I survived!!! Tiny hosted her first sleepover this weekend, with her three best friends. They were adorable! I will say, it has been a while since I thought about exactly how much noise 4 ten year old girls can make at two AM, but now I know. I have always loved a house full of kids – I wish I had a house full of my own most of the time. They are the funniest little things! Tiny settled on a Wizard of Oz theme night, so of course I was all over that. My house looked like a unicorn sneezed rainbows all over the living room and dining room – I have no regrets. Combine all three in a pan and simmer (or slow cook on low in the crock pot) until the sauce thickens, reduces a bit, and the wieners are warm. All done. 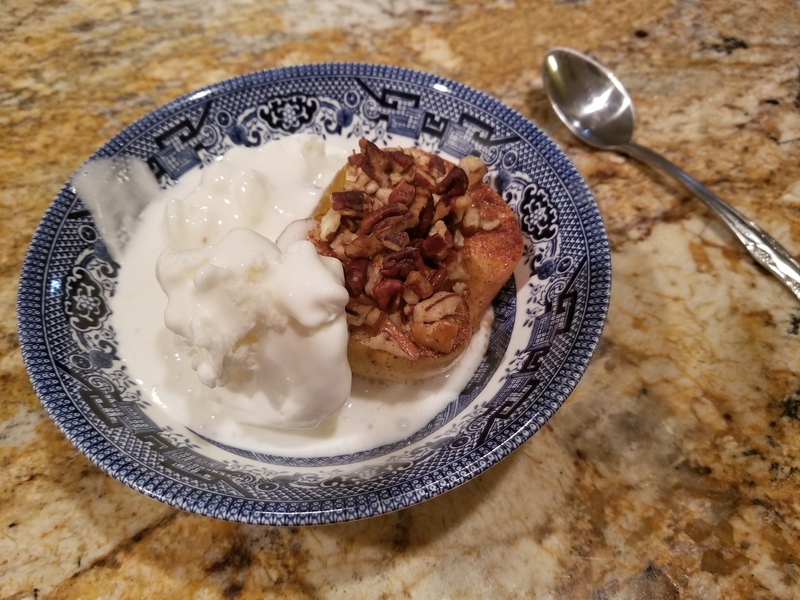 This is a Southern holiday season/ party food staple, and my kids are obsessed with them. They love them – to the point that they ask for a “party night’ so I’ll cook them. These rainbow fruit kababs are so very easy! I used 6 inch skewers to make the kabab a little more manageable for the kids. I simply layered pre cut fruit from the produce section of my grocery store in the rainboy (ROY G BIV – Red, Orange, Yellow, Green, Blue, Indigo, Violet) pattern and boom, done! These probably took me about 10 minutes to put together, and they were a bright and healthy addition to the junk fest that the evening devolved into. It was a sleepover after all! Oh my rainbows! I was really happy with the way our rainbow pizzas and flatbreads came out. I use mozzarella cheese shreds in a large family sized bag. I placed 1/6th bag of cheese in one zip lock bag each. To color the cheese, I simply used liquid food color. Mix the food color into the cheese the same way you would if you were coloring coconut to use on a cake. Just gently mix around with your fingers until you integrate the color into the entire contents of the bag – add more to make it the intensity you like. I mixed mine the night before and stored in the fridge until the girls were ready to make flat breads. You can tell which ones I made versus the ones the girls made – they were so creative! I loved how they looked like little impressionist abstracts after we baked them (350 until the cheese melts and the crust is crisp). To serve, I cut into strips and plated them – on rainbow plates of course. For dessert I made Ruby Slipper cup cakes and rainbow cupcakes. The girls thought the rainbow ones were cute, but LOVED the shiny ruby slippers. To make these, bake cupcakes in any flavor, as normal. I use the wilton recipe to make my butter cream, but you can use your favorite. For the color, I like to use gel paste food color for this icing. Liquid is fine for many things, but I like the intensity I get with paste for baked goods. I mixed red into most and piped the icing onto the cupcakes in vertical squiggly lines to give some texture to the top. I immediately dusted (and by that, it was more of a dust storm) with sanding sugar to cover ever inch of available icing with sparkles. The sole of the shoe and heel spike were made using Vienna Fingers covered in red chocolate (you can get colored candy chocolate from the candy isle of your local craft store) and coated in sanding sugar – they are RUBY after all. I dipped the tip of a 3 inch section of Pirouine cookie into the red chocolate to form the heal tip, and then dusted it with sanding sugar as well. To assemble, wait for soles to set, then press the end of one cookie into the side of a cupcake, propping on heal cookie for support. They are adorable little high heeled shoes at that point. I saw these for bachelorette parties, Barbie parties, and just kept thinking that it would make the perfect ruby slipper for Dorothy! The rainbows were super simple. I used rainbow jelly sours and cut to size – about 4 inches in length. I iced the cupcakes in sky blue, then pushed the rainbows into the top of the cake. Mini marshmallows formed clouds around each side base. Done – so easy and adorable. If you are transporting these, the rainbows are the way to go – or wait to assemble the shoes until you reach your destination – they are not terribly stable when you set them up. Of course, we had to have a nod to the Wicked Witch of the West. 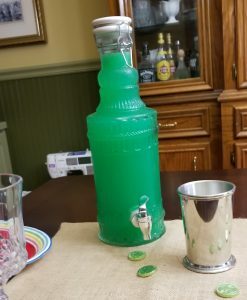 To drink, I colored lemonade a bright green, stored in a lovely glass decanter and labeled it as Melted Witch. The girls looked a little more closely at it, but loved it once they ventured over to the table. Just for fun, I decorated the table runner with a few little nods to parts of the movie. 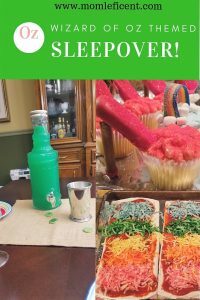 I added julip cups with candy treats down the center of the table. Tin Man hats – Hershey’s Kisses, a gift from the Lollipop Guild (rainbow lollipops), Rainbow Beams (the rest of the rainbow gummy sour strips), and melted troubles (lemon drops – ‘cause troubles melt like lemon drops, away above the chimney tops…). Finally, some coins (green chocolate coins from Party City) were stress free and added a little bit of interest to the table – of course they were Emerald City coins. You would have thought these little ladies were having a Christmas party the way they began to go at the candy. It was such a special night, and Tiny was delighted to have her friends over while she played hostess. Honestly, I am exhausted, but I can’t wait until we get to have the girls over again – they are such a great little group. 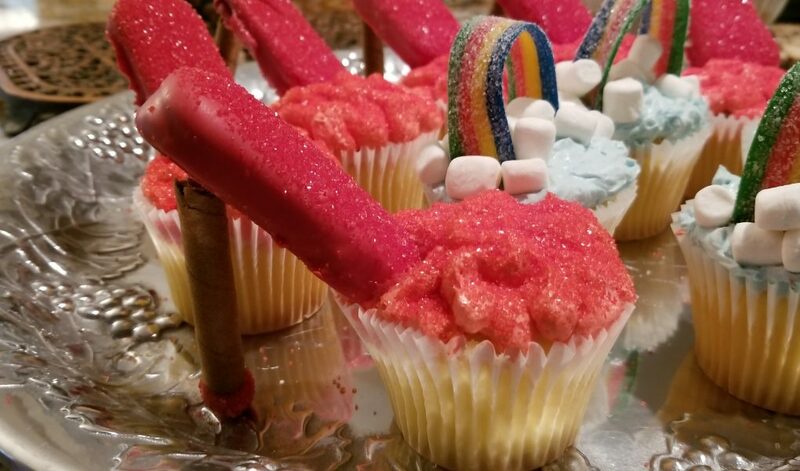 Drop some photos of your cupcakes and favorite Oz themed food. This looks like it would be so much fun!! Thank you for sharing this!! I absolutely loved watching the girls have a blast. It was great until they began having a “scare fest” at 2:00 AM. I think the only person they scared was me! 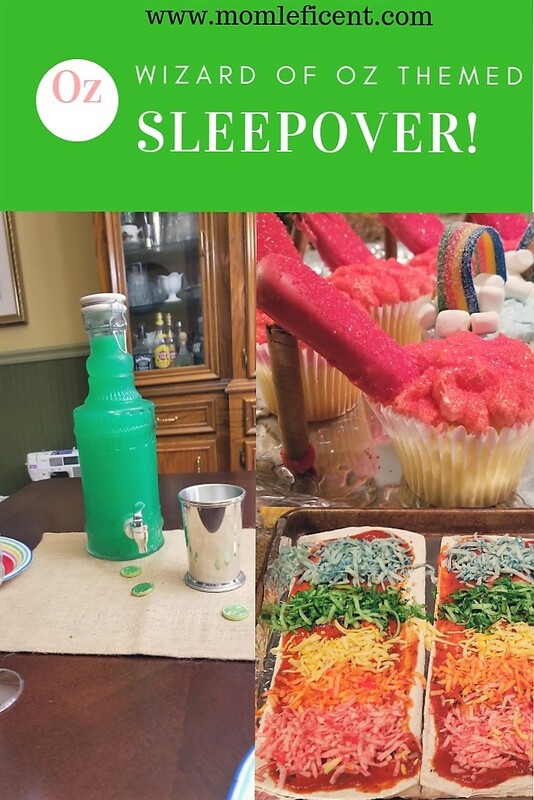 Oh man, this looks like so much fun and a wonderfully creative way to have a sleepover. 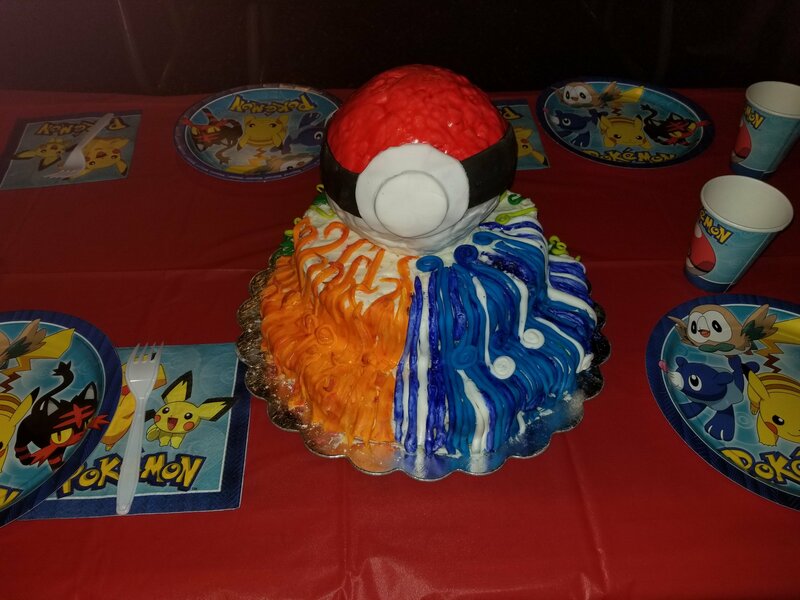 The rainbow cheese was a nice touch. Going to have to try that at some point, would make pizzas extra fun. It was amazing. The girls didn’t want to leave! The pizzas were so pretty! They started mixing the colors and they blended when they melted. It was so pretty!